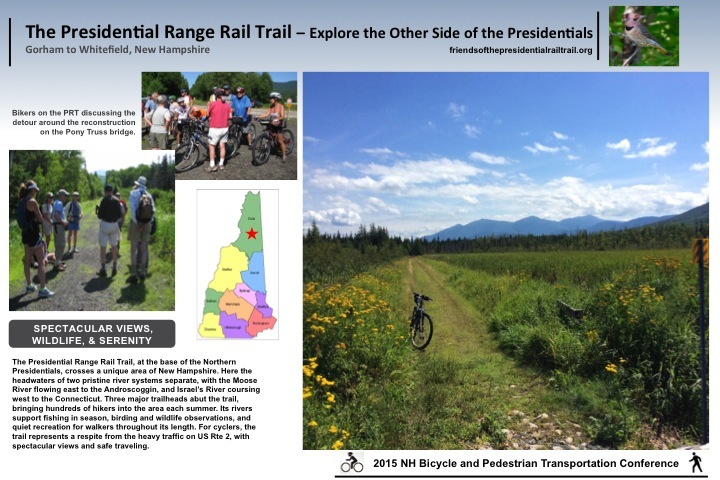 The Friends of the Presidential Rail Trail have joined together to promote, protect, and maintain New Hampshire’s Presidential Rail Trail between Gorham and Whitefield for non-motorized recreation during the snow-free times of the year. The Presidential Rail Trail stretches for about 20 miles from Gorham to the Airport (Hazen) Road near the Whitefield airport. While you may observe birds anywhere along the trail, there are two main “hotspots” for birding. A couple of others are worth exploring; the Whitefield Airport area itself, which, although strictly speaking not on the trail, is special. One hotspot is in eastern Randolph towards the Gorham end of the rail trail, while the other is at Cherry Pond in the Pondicherry Wildlife Refuge near the western end of the trail. Although many of the birds that you are likely to find are common to both hotspots, the two sites offer quite different birding experiences. The Randolph section of rail trail is an intimate setting, with the birds in close proximity to the trail, whereas near Cherry Pond the open water and wetland areas extend over a much larger area, and the birds are further away. Of course, this larger pond attracts more waterfowl, especially during migration. Starting where the PRT intersects the Dolly Copp (Pinkham B) Road in Randolph, a half-mile stretch heading east towards Gorham provides very interesting birding. In the summer I have observed more than 50 species here. The first quarter-mile heads through mostly deciduous, fairly dense woods with a small amount of slowly moving water beside part of it. The next quarter-mile is an open area with beaver ponds and wetlands. Beyond this, the trail runs through mostly coniferous woods at the base of a ridge on Mount Madison. Thus, the habitat varies significantly over a short distance. The open area near the beaver ponds is the most productive for birding; sometimes you can spot other wildlife such as beaver, otter, bear or moose. black-capped chickadees, and a hermit thrush or veery, although you are more apt to hear rather than actually see them. Similarly, a pileated woodpecker might be heard or glimpsed here, as well as further down the trail. Wild turkey wander along or across the trail. kingfisher or two can usually be spotted checking for prey in the ponds. A very frequent presence is a pair of solitary sandpipers; occasionally other wading birds may be observed. An American bittern shows up here but if you see a bittern, it is usually flying away from you, as they are quite shy birds. Ruby-throated hummingbirds visit the flowers alongside the trail. Overhead you will undoubtedly see and hear American crows and blue jays fly by or perch. Very commonly broad-winged hawks can be observed. Cooper’s hawk, American kestrel and merlin are less common. In addition to pileated woodpecker, both hairy and downy woodpeckers are common, as well as yellow-bellied sapsucker and Northern flicker. The number and variety of ducks is usually not large, depending somewhat on the water level in the beaver ponds, but it is not unusual to see hooded merganser, wood duck, and mallard. Song birds are varied and change a lot with the season, although some clearly nest here. You can expect to see goldfinch and sparrows, most commonly song sparrow, swamp sparrow, and white-throated sparrow. Warbler observations are quite seasonal but nesting species include common yellowthroat, yellow-rumped warbler, and ovenbird. Others less commonly observed include palm, chestnut-sided, black-and-white, blackburnian, and magnolia warblers. The latter warblers are most often found where the alders and conifers begin toward the end of the marshes, along with black-capped chickadee and red-breasted nuthatch. Red-eyed vireos are always around during the summer, and, during migration, blue-headed vireos and an occasional yellow-throated vireo. Rusty blackbird, Eastern bluebird, and American pipit are fun species to spot here, again usually in migration. Cherry Pond is the largest body of water in the Pondicherry Wildlife Refuge. A viewing platform for the pond is accessible by a very short side trail off Presidential Rail Trail. The entire wildlife refuge should be considered a hotspot for birding with quite a few different habitats to visit. In addition to Cherry Pond, but not directly along the Presidential Rail Trail, are Little Cherry Pond and Mud Pond. Cherry Pond is large enough that common loons frequently visit and nest there. Great blue herons have nested as well. Many waterfowl can be seen: common goldeneye, white-winged scoter, pied-bill grebe, and wood and ring-billed ducks. At the Big Sit birding event on Columbus Day weekend in October, it’s not unusual to see more than 40 bird species just from the platform at Cherry Pond. Ruffed grouse are commonly encountered on the rail trail near the platform. Many of the bird species that are listed above for the Randolph site are seen here as well. In fact, overall, around 170 species have been seen in the wildlife refuge. Another site somewhat different from either of the major “hotspots” is the Randolph Community Forest extension on the south side of U.S. Route 2 known as the Farrar tract, after the family who farmed the property for many years. This site is about 3.5 miles west of the Appalachia trailhead. What was formerly a farmer’s meadow extends from the rail trail about 100 yards down to Israel’s River. It is still mowed annually to maintain the meadow. Willow flycatchers can be found here, and it is also a good place to see belted kingfishers. Among others, the meadow attracts ruby-throated hummingbirds, and the river, spotted sandpipers. This open area provides good viewing overhead to see hawks and an occasional eagle flying over. Another site on the rail trail worth a look is the Moorhen Marsh wetland area just to the east of Cherry Pond. Here you may see the marsh wren or certainly hear it calling in the early summer. 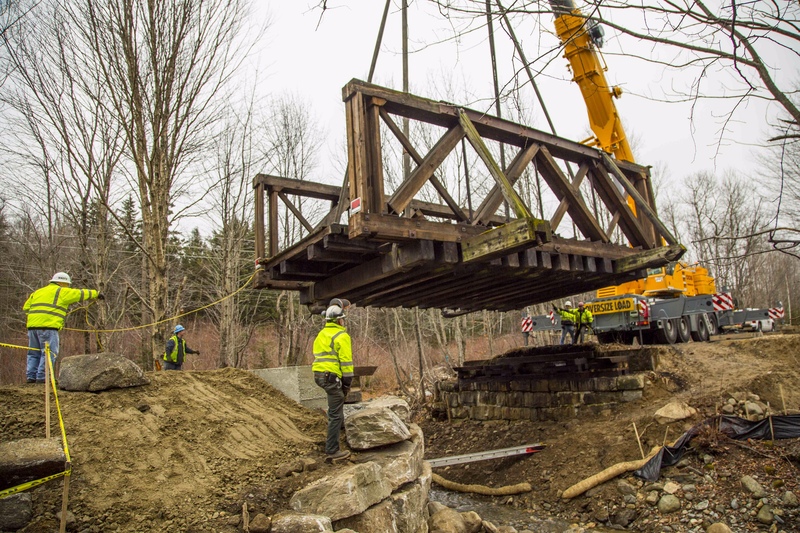 The repaired Snyder Brook pony truss bridge on the PRT was reinstalled on December 5, 2015. 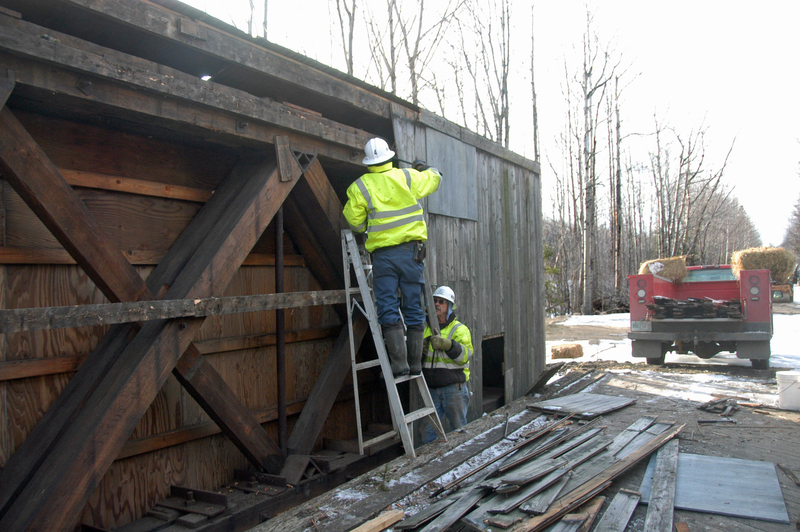 This winter it will be open to the public for snowmobilers, skiers, and walkers, and next spring it will remain open for bicyclists, hikers and pedestrians while c arpenters restore the siding that protects the structure. The video link here shows the moving of the bridge from its original space. Pony truss bridges have two distinguishing features: wooden diagonal braces, together with steel tension rods that hold the braces in plumb. This single-span bridge style was used frequently by the Boston & Maine Railroad as a substitute for steel bridges because it was both inexpensive and, before failing under the weight of a train, gave clear signs of deterioration. “The Snyder Brook bridge is significant as… the last surviving wooden railroad track pony truss bridge in the United States that retains integrity of design, location, setting, materials, workmanship, feeling, and association,” writes James Garvin, former NH state historian in the NH Division of Historical Resources inventory. water pressure during the spring run-off. The bridge was then closed to all traffic, and snowmobiles were rerouted. The following summer, it became evident that the bridge might not withstand another winter. For over a year, the NH Bureau of Trails had been developing a plan of action as well as obtaining funding for the repair through the federal Recreational Trails Program. They were able to authorize and implement an emergency rescue. 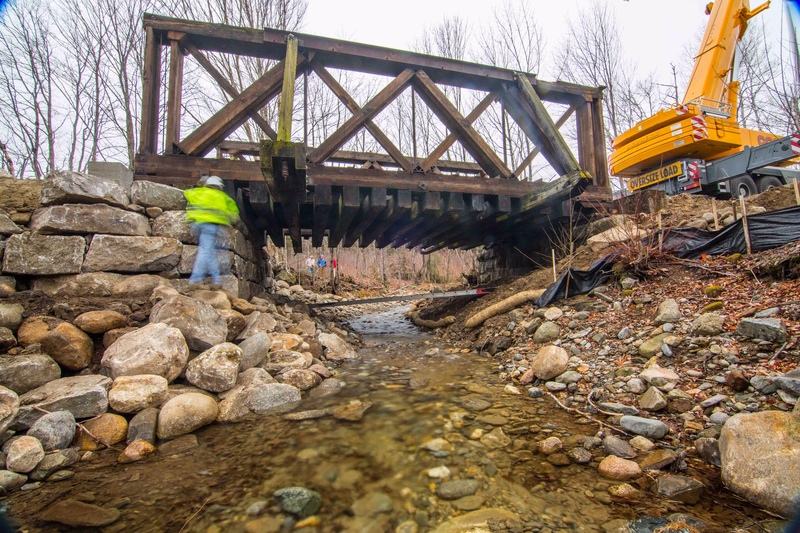 By early December 2014, they had engaged large-project contractor New England Field Services, LLC, to prepare a dirt platform on the west side of the brook and to remove the interior wood siding so the bridge could be moved. 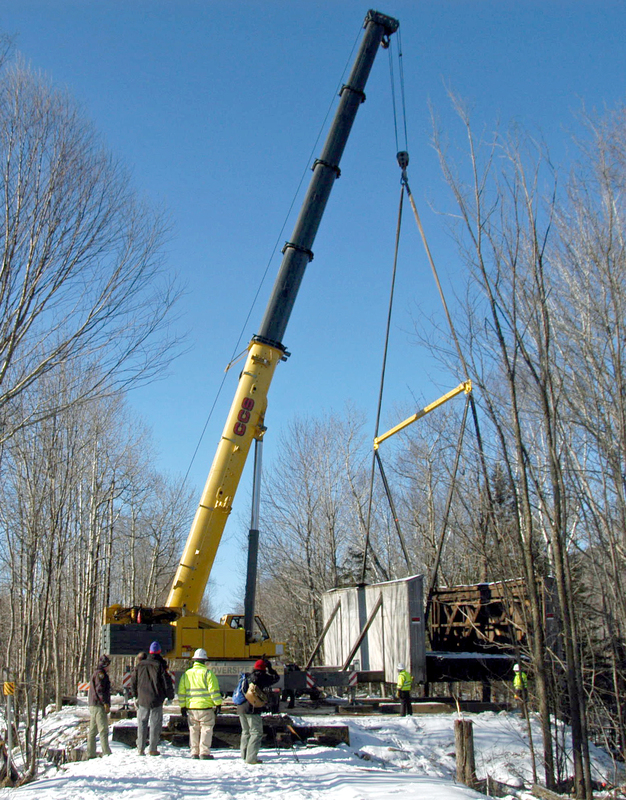 On December 5, 2014, a 275-ton-capacity crane operated by Vermont’s CCS Crane Service lifted the bridge off its abutments and swung it onto the prepared site. The final steps were taken with the return of the crane, and the successful lifting of the pony truss bridge back into its original position on December 5th. NH Division of Historical Resources Director Ben Wilson is now planning where to provide interpretative information about the Presidential Rail Trail’s historic treasure. A rapid-motion video of the move “back home” is linked to the post below this account. Much of the information for this article has come from two sources: former NH historian James Garvin, who completed the bridge’s inventory for the NH Division of Historical Resources; and Edith Tucker, from her articles in the Berlin Reporter and Coos Democrat. Abby Evankow describes a recent loop using the Presidential Rail Trail from Gorham 15 miles, about 3 hours. One of the appeals of this loop is that you can get on at several different points–from your motel in downtown Gorham, from your campsite at Dolly Copp Campground or Moose Brook State Park, or from the Rail Trail parking lot on Rte 2, just west of Gorham. We got a late start on our mid-September ride because of a flat tire. Fortunately, Crooker Cycle Sports (240 Glen Ave., Berlin, 603-752-3632) graciously replaced the defective tube so we weren’t held up for long. We parked at the Rail Trail Parking lot and headed west, toward Randolph, on the Presidential Rail Trail. It’s a beautiful bike path with a gentle uphill grade along the Moose River with increasing views of the Presidential Range. Even cycling at mid-day, much of the trail is nicely shaded by the thick forest on each side. After about 2 miles, you’ll cross a bridge and find hidde n, just off the trail to the north (right), a big gutted concrete structure. This is what remains of the Mount Madison Spring Company that bottled the spring water at the turn of the century and made various drinks, including Dolly Copp Ginger Ale. (When you’re back in town, visit the Gorham Historical Society, 25 Railroad St.-466-5338.) When you reach the open beaver pond and marsh, you’ll know you’re getting close to the junction with Dolly Copp Rd (also known as Pinkham B Rd). A giant blue heron took flight, not 10 feet from us. This is a great spot for birdwatching. We left the PRT, turning east (left) on the Dolly Copp, a seasonal road that passes through the White Mountain National Forest and connects Rte 2 and Rte 16. We definitely appreciated the thick shade as the terrain got steeper–no railway grade here, but the 2-mile climb to the height of land is nicely modulated. A few cars passed us, but we mostly had the alternately rough asphalt/packed-dirt road to ourselves. Just over one mile up, on the right, is the Town Line Brook Trail, an easy 0.2 mile walk to scenic Triple Falls. It’s a steep, narrow gorge with plenty of lush moss, quite scenic despite the low flow. We appreciated the break and got back on our bikes to finish our climb. At the height of land, you’ll see the trail head and parking lot for the Pine Link Trail up Mt. Madison. Coasting down was lovely, but once we realized there were potholes of various sizes, camouflaged by the shadows, we slowed our descent. About a mile down on our left, we passed the gated entrance to a snowmobile route–the Bear Springs Trail, a more rugged path with ups and downs, some uneven terrain as well as a few muddy patches. Being novice mountain bikers, we stayed on Dolly Copp Rd to Rte 16, roughly another mile. Here, we turned north (left) and cruised easily on a wide, smooth shoulder downhill all the way back to Gorham. While we missed the peace and quiet of the woods, we got to admire a handsome BIG moose, eating brush along the roadside. Once in town, we stopped at the White Mountain Cafe (212 Main St. Gorham 603-466-2511), one of our favorite places for a caffeinated beverage, lunch and cookie. To finish our ride, we turned left onto Bellevue Place at the sign for the Gorham airport, and flowed this quiet, dead-end street to a big locked gate that conveniently has a well-worn path for bikes and walkers to get around. The packed dirt road took us back to where we had started, at the PRT parking lot on Rte 2. Including the stops at Mineral Springs bottling plant, short hike to Triple Falls, and wild-life photography, we made the approximately 15 mile trip in less than 3 hours. Members of the FPRT are planning to attend an all-day conference on bicycle and pedestrian transportation that the Bike-Walk Alliance of New Hampshire is sponsoring. The event will be held in Concord at the NH Department of Environmental Services on Wednesday, September 30, 8:30 am to 4 pm. A panel discussion on Rail Trails is scheduled from 10:30 am to noon. To help publicize the PRT, the Friends have created the poster reproduced here.